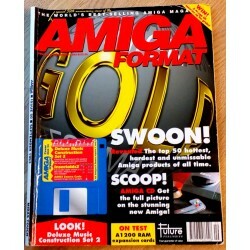 Magasiner Det er 340 produkter. Magasinet er i fin stand. 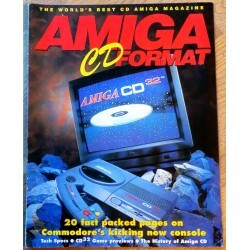 Tech Specs, CD32 Game Previews, The History of Amiga CD. 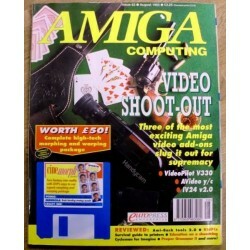 Ami-Back Tools, KidPix, Survival guide to printers, Proper Grammar II, VideoPilot V330, AVideo yc, IV24 v2.0, Video shoot-out. I fin stand. 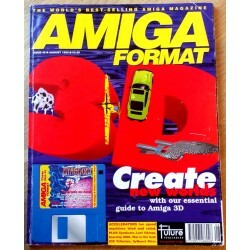 V Lab YC, Office shareware, Phone Pak, Colour scanner, Survival guide to hard drives, Printer round-up, Amiga CD32. I fin stand. 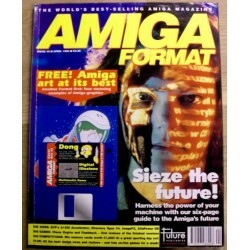 Virtual Reality, Samplers survival guide, Floppy round-up, AC awards, Show report, Database round-up, Montage 24. I god stand, men rift på front/bakside etter teip som har holdt cover-diskettene på plass. Pent behandlet og i fin stand. Datablad. Pen stand. 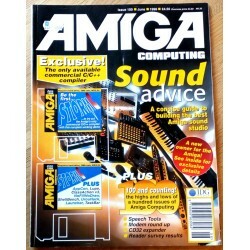 Les om CD32 Expander, Speech Tools, Championship Manager 2, Pro Rugby og mye mer. Bra stand. 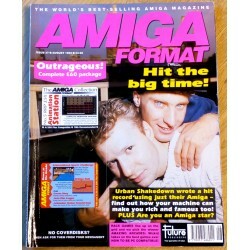 Les om Jim Power, Dylan Dog, Cool Croc Twins, Risky Woods, John Barnes Football, Hostile Breed og mye mer. Bladet er i god stand. Bruksspor på perm. 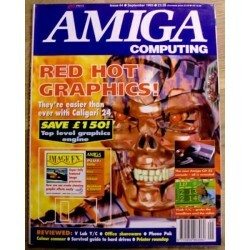 Les om Amiga 1200 og Amiga 4000, Road Rash, Shadow of the Beast 3, OpalVision og mye mer! 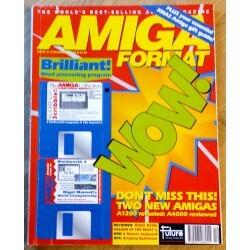 Amiga Format: 1992 - December - Wow! 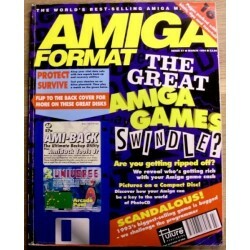 Road Rash, Shadow of the Beast 3, Miracle keyboard, Amazing OpalVision, A1200 revealed, A4000 reviewed. I god stand, lest. Magasinet er i bra stand. 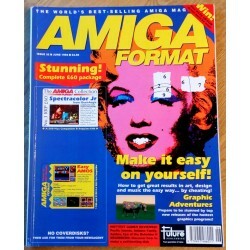 Les om Amiga 600, A570 CD-ROM, Monkey Island 2, Parasol Stars, Sensible Soccer, Dune og Power Scanner 2. Bra stand. 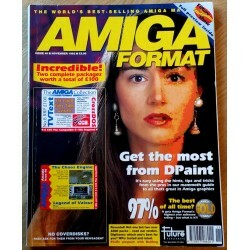 Les om Pacific Islands, Apidya, Eye of the Beholder II, TV Paint, Project X, The Addams Family og Imagine 2. Magasinet er i bra stand. 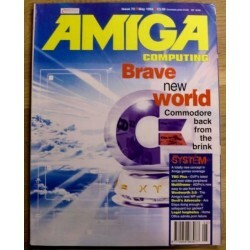 Les om Aquatic Games, BAT II, Red Zone, Lotus III, AMOS Pro og mye mer. Bra stand. 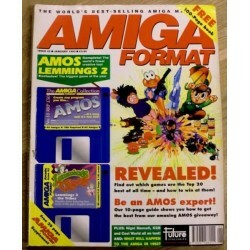 Les om Plan 9 From Outer Space, Bug Bomber, Kwik Snax, Narco Police, Paper Boy 2, Zool og Sim Earth. Magasinet er i bra stand. 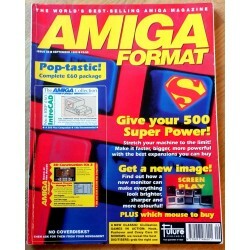 Les om A-Max II Plus, AVideo 24, Action Replay III, Crazy Cars 3, Hook, Hoi, Guy Spy, Super Tetris, California Games 2 og mye mer. Bra stand. 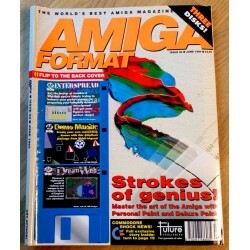 GVP 1230, Directory Opus V4, ImageFX, Chaos Engine, Flashback og mye mer. 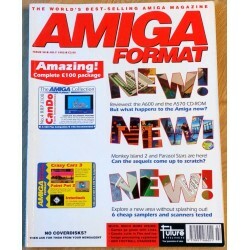 GVP 1230 accelerator, Directory Opus 4, AlfaPower HD, Chaos Engine, Flashback, ImageFX, Seize the future. Bladet er i god stand. Magasinet er i bra stand. 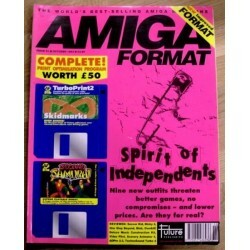 Les om Maniac Mansion, The Addams Family, Super Cauldron, Lost Vikings, Trifecta 500 LX, Pinball Magic og Space Legends. Magasinet er i bra stand. 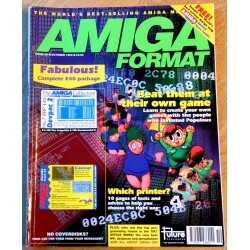 Les om Bignose the Caveman, Joe and Mac, Piracy, TV Sports Boxing, VideoMaster, GigaMem, Oki OL-400 Printer og mye mer. I god stand med bruksspor. 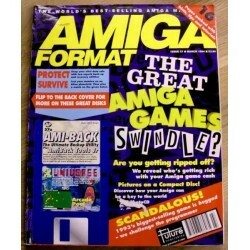 Top 20 Amiga games of all time, KGB, Cool World, Nigel Mansell, What will happen to the Amiga in 1993. Magasinet er i fin stand. 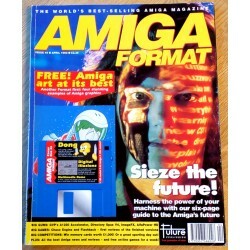 Les om Amberstar, Future Wars, Fireforce, Nicky Boom, Morph Plus, Final Copy 2 og Zappo A500 hard drive. Magasinet er i bra stand. 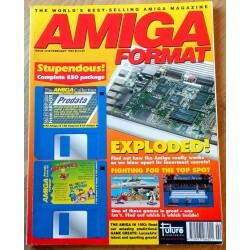 Les om Superfrog, The Ancient Art of War in the Skies, Adorage, G-Lock og Amiga 4000. 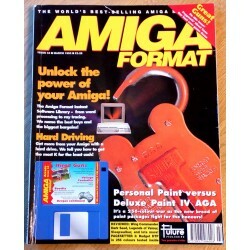 Amiga Format: 1993 - March - Amiga Power! Bladet er i bra stand. Les om Wing Commander, Dark Seed, Legends of Valour, Sleepwalker og mye mer. 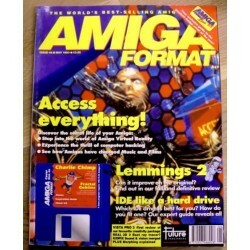 Amiga Format: 1993 - May - Access Everything! I fin stand. 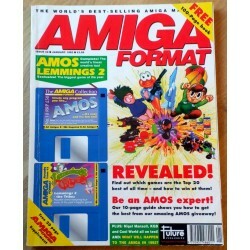 Lemmings 2, Vista Pro 3, KidPix Sound Vision, Morphing explained, IDE like a hard drive, Access everything. Magasinet er i bra stand. 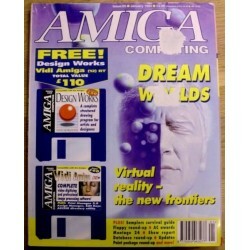 Les om Vista Pro 3, Real 3D 2, Lemmings 2, Body Blows, Terminator 2, Metal Mutant og mye mer. Magasinet er i bra stand. Les blant annet om Soccer Kid, Nicky 2, One Step Beyond, TechnoSound Turbo 2, ADPro 2.3 og mye mer. Fin stand. 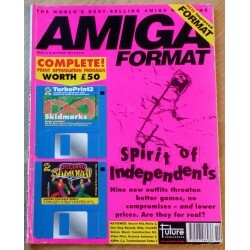 Spirit of independents, Soccer Kid, Nicky 2, One Step Beyond, Blob, Overkill, TechnoSound Turbo 2, Music Construction Kit. 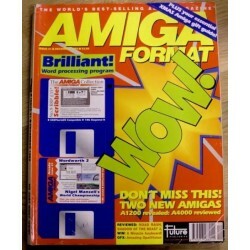 Amiga Format: 1993 - September - Swoon! 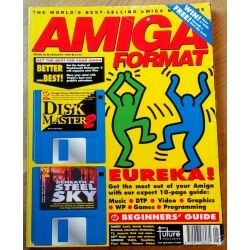 Datablad som omhandler Amiga i fin stand. 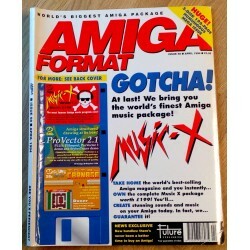 Amiga Format: 1994 - April - Gotcha! 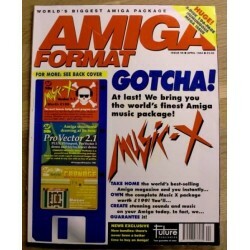 Music-X, Clarissa, Personal Paint, Hard Drives, Networking, NewTek, Chuck Rock CD32, Microcosm, Dennis, Hyperion, Legacy of Sorasil, Manchester United. I fin stand. Bladet er i fin stand. Omhandler Amiga. Amiga Format: 1994 - August - Driving Force! Magasinet er i god stand. Les om CD32 games and Amiga CD-ROM - now A1200 owners can have it all!, Banshee, Empire Soccer, Kick Off 3 og mye mer. God stand. 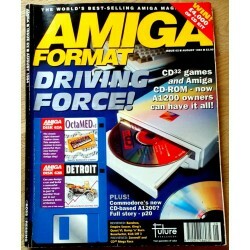 Les om CD32 games and Amiga CD-ROM, Banshee, Empire Soccer, Kick Off 3, Zeewolf og mye mer. 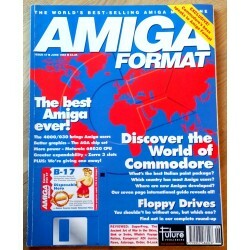 Mortal Kombat II, Run the RISC, Chelsea attack!, Video Options Card, CD-ROM round-up, Easy Ledgers 2, World of Amiga. I fin stand. Magasinet er i bra stand. 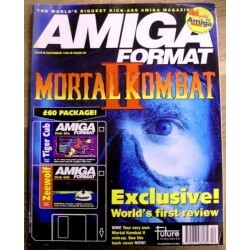 Les om Zool 2, Mortal Kombat, Liberation, Vidi24, Final Writer, Jurassic Park og mye mer. 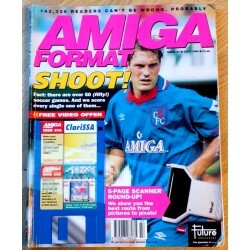 Amiga Format: 1994 - July - Shoot! Bladet er i bra stand. 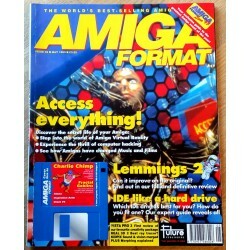 Les om Bars & Pipes Pro 2.5, TBC+, James Pond 3, Impossible Mission 2025 AGA, Super Methane Brothers, The Ultimate Pinball Quest og mye mer. Bladet er i god stand. 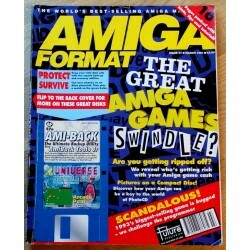 Les om James Pond 3, Valhalla, Super Methane Brothers, The Ultimate Pinball Quest og mye mer. Bladet er i god stand. Omhandler Amiga. Magasinet er i bra stand. 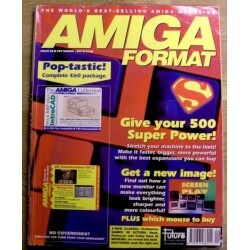 Les om Beneath a Steel Sky, Bubba and Stix, Batman Returns, Puggsy, Fire Force CD32, Deep Core CD32 og mye mer! Pent behandlet datablad i fin stand.